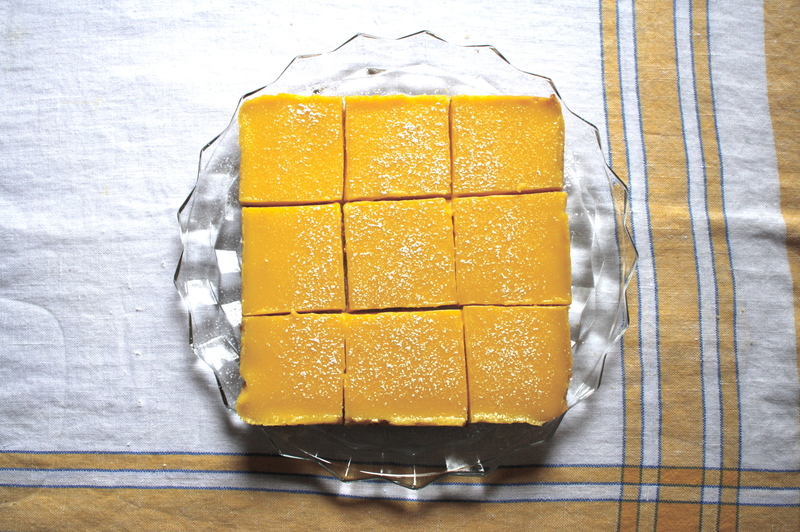 I am always looking for recipes using egg yolks or egg whites, to use up whichever I have sitting in my fridge, begging to be made into something. Like I need another sweet sitting on my counter…this time of year it’s birthday after birthday in my family, so I’m on a cake baking spree from the beginning of January until late February. But, no matter, these lemon bars were a nice break for us in our parade of cakes. I love Meyer lemon season, and try to make things with them as often as possible, including savory things with preserved lemons in them like this and this. Oh, and this. I also usually make a batch of the preserved lemons to have on hand for the year. Make sure you keep a close eye on the crust while it’s baking…I would recommend starting to check it at about 22 minutes. 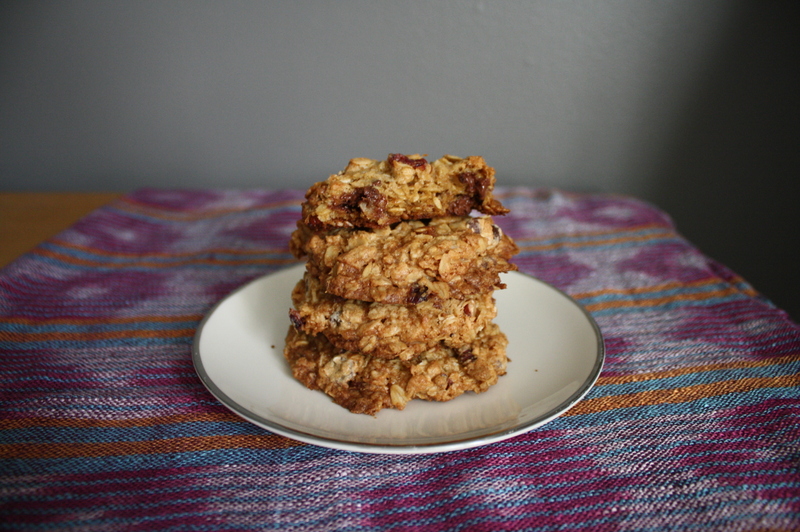 The first time I made these, I just set the timer at 25 minutes and didn’t pay attention and they got rather brown. 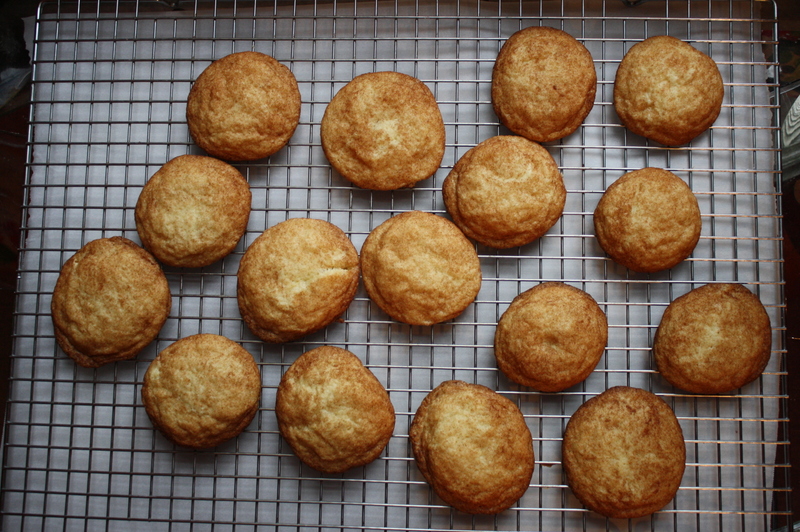 Still yummy…but much better when they’re golden! 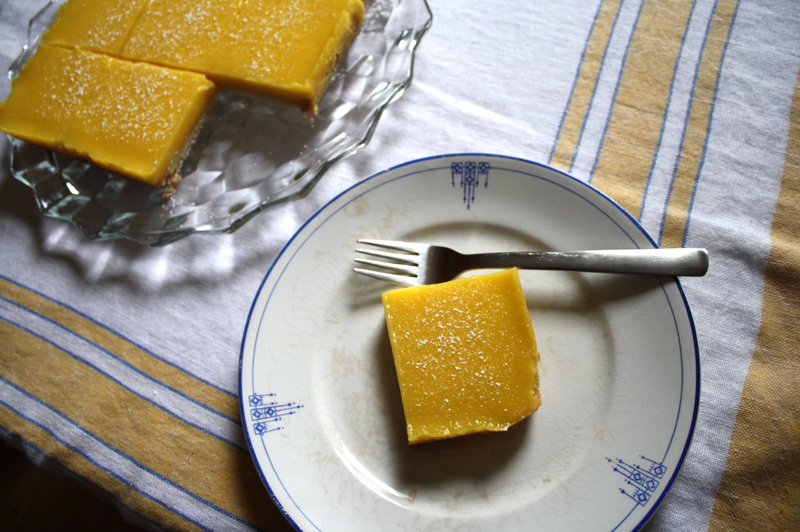 These can easily be made with regular lemons, and would probably be very good with limes as well. Cover a 9-inch square cake pan with two sheets of heavy duty aluminum foil or parchment paper, perpendicular to each other. Spray with nonstick cooking spray and set aside. 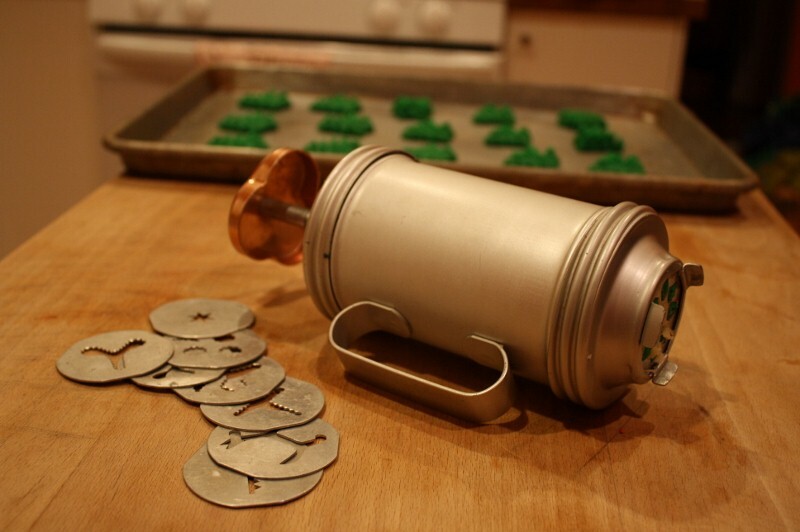 Put the flour, powdered sugar and salt in a food processor and process briefly, about 2 seconds. Add the butter pieces and process to blend, 8 to 10 seconds, then process until the mixture is pale yellow and resembles coarse meal, about three 1-second pulses. Sprinkle the mixture into the prepared cake pan and press firmly with your fingers into an even layer over the entire pan bottom. Refrigerate for 30 minutes. Heat the oven to 350 degrees. Bake the crust until golden brown, about 25 minutes. Set aside. In a medium saucepan whisk together the egg yolks and whole eggs until combined. Add the sugar, meyer lemon juice, zest and salt until well combined, about 30 seconds. Immediately pour the curd through a fine-mesh steel strainer set over a medium bowl. Stir in the heavy cream and then pour the curd into the warm crust. I know, I know…here we are posting another &^%#@! Cook’s Illustrated recipe. 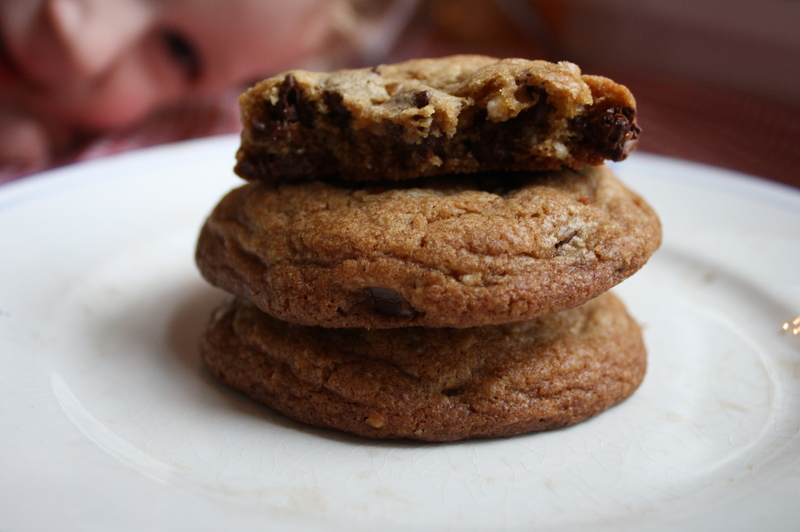 But I promise, these will be the best chocolate chip cookies you will ever make, so all the extra work that those blasted people at Cook’s make us do is very worth it. They really are for everyone: they’re chewy, soft and crispy all at the same time. Crispy on the edges, chewy and soft in the middle. 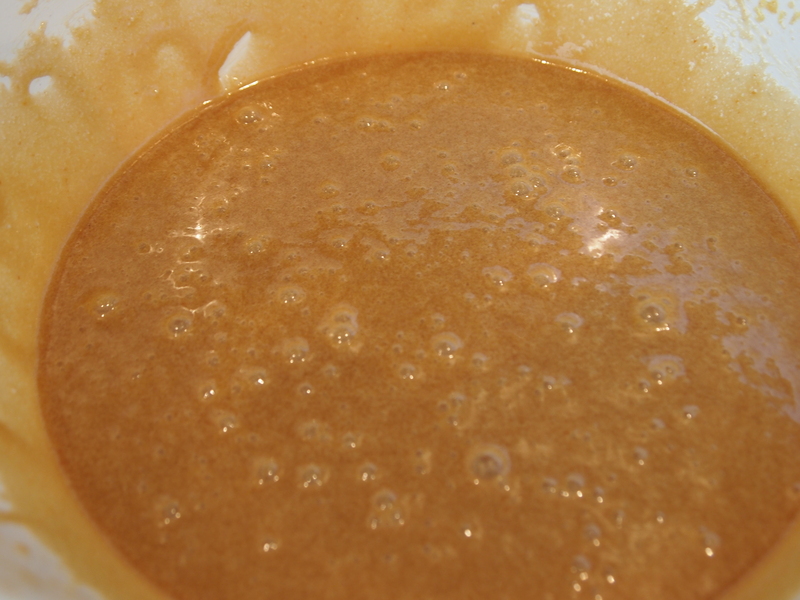 One of the extra steps is browning the butter, which gives them a nutty, toffee-like flavor (and adds to the chewiness). 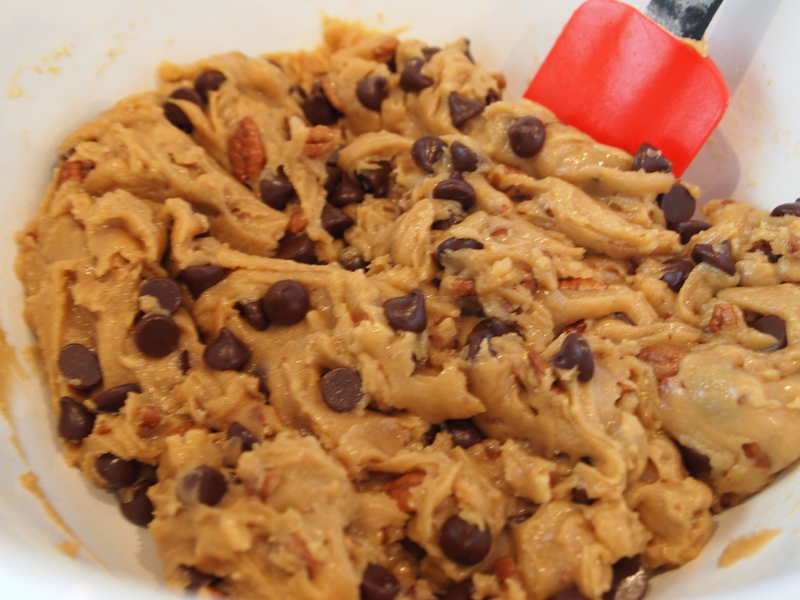 The whisking and resting for 3 minutes (the other extra step in the recipe) is key to the success of your cookies. I don’t remember the scientific stuff from the original article in Cook’s, but this process, along with the browned butter, is what makes them so chewy on the inside and crispy on the edges. It’s tiresome, I know, but just think of it as extra arm exercises for the day! I promise you will never make a Toll House batch again. Randy made these cookies for Valentine’s Day and they were so fabulous, I suggested to Margaux that we each bake a batch and do a joint post. She had made them before so she readily agreed! I must say these are the best chocolate chip cookies I’ve ever eaten for all the reasons Margaux stated. 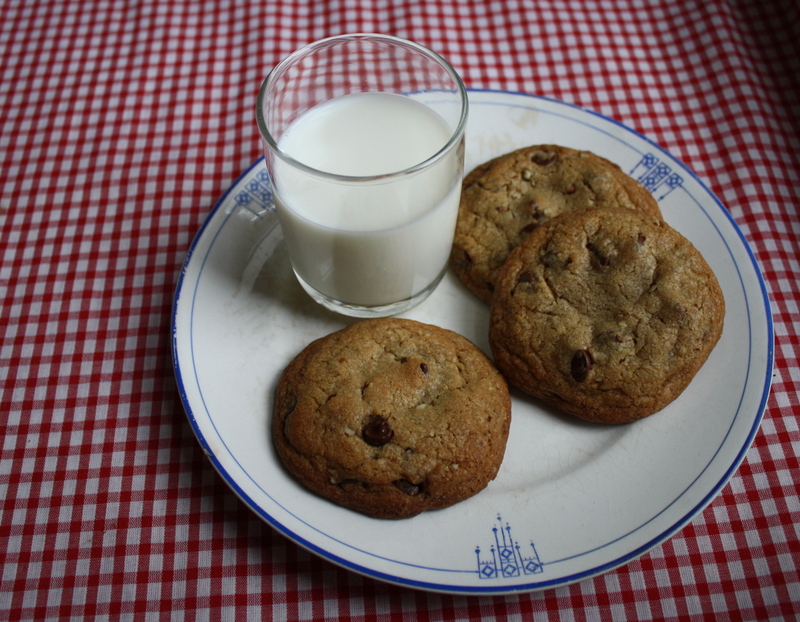 I also proposed that we title these cookies “Best Chocolate Chip Cookie Dough Ever” :-). These are totally worth the Cook’s Illustrated extra-scientific steps, although when I got to the part where you whisk for 30 seconds and let rest for 3 minutes – TIMES 3! – I thought that a funny video could easily be made about these cookies like the one about CI beef stew that was going around recently. 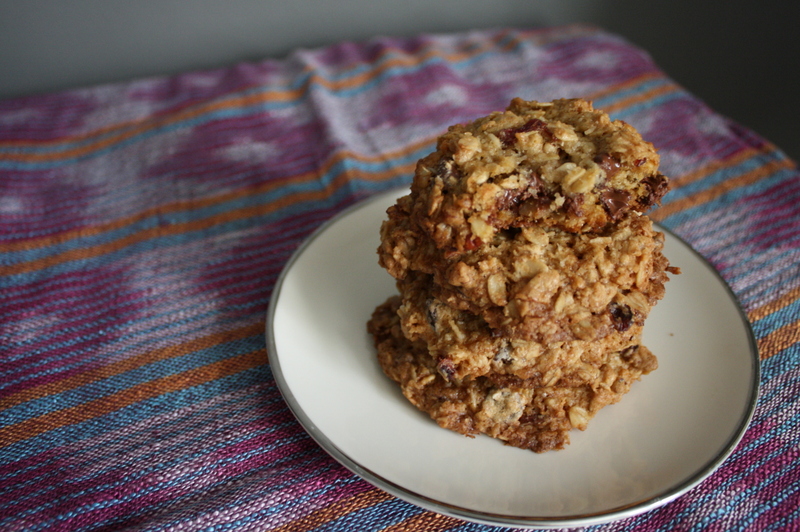 You might be tempted to use an electric mixer, but these cookies are totally done by hand mixing – another thing that contributes to their delicousness. To prepare oven, baking sheets: Adjust oven rack to middle position. Preheat oven to 375 degrees. Line 2-3 baking sheets with parchment paper. (AS note: my cookie sheets were on the small side, so I ended up needing 3.) Set aside. To brown butter: In 10-inch skillet, melt 10 tablespoons butter over medium-high heat. (Note: Avoid using nonstick skillet; dark color of nonstick coating makes it difficult to gauge when butter is sufficiently browned.) 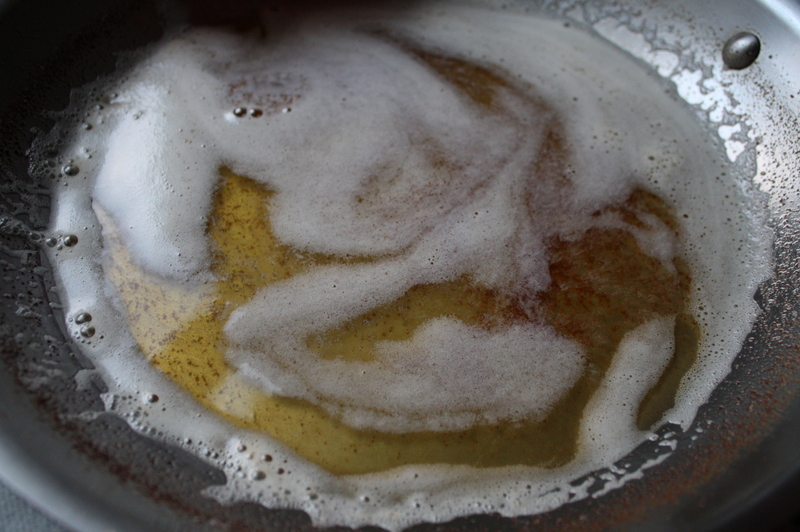 Cook, swirling pan constantly, for 1 to 3 minutes or until butter is dark golden brown and has nutty aroma. Transfer browned butter to large heatproof bowl. Add remaining 4 tablespoons butter. Stir until completely melted. In medium bowl, whisk together flour and baking soda. Using rubber spatula, stir flour mixture into sugar mixture for 1 minute or until just combined. Stir in chocolate chips and nuts. Give dough final stir to ensure no flour pockets remain and ingredients are evenly distributed. 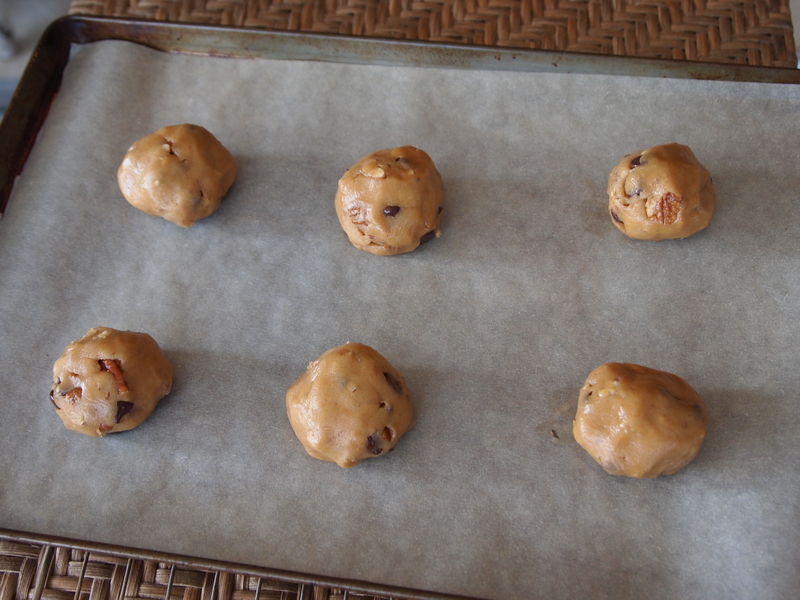 To shape and bake cookies: Scoop up 3 tablespoons dough. Roll into ball. Place on prepared baking sheet. Repeat with remaining dough, placing balls 2 inches apart. 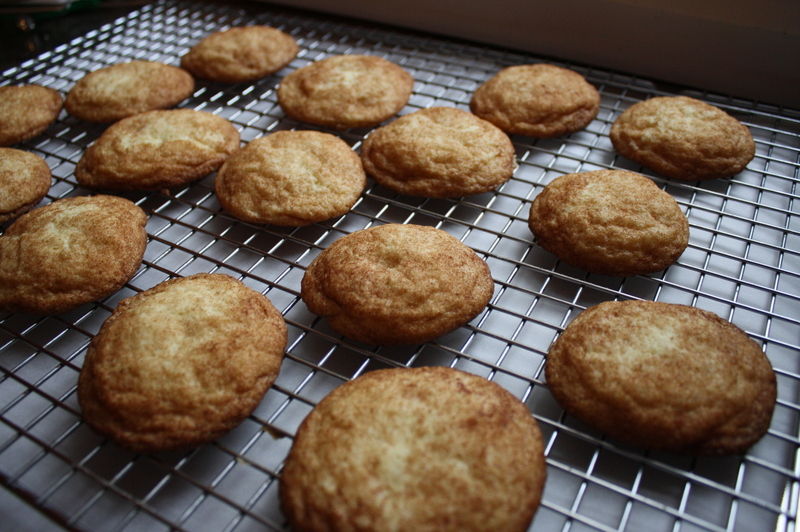 Bake 1 sheet at a time for 10 to 14 minutes or until cookies are golden brown and still puffy and edges have begun to set but centers are still soft. (Note: Rotate baking sheet halfway through baking.) Transfer baking sheet to wire rack. Cool to room temperature. 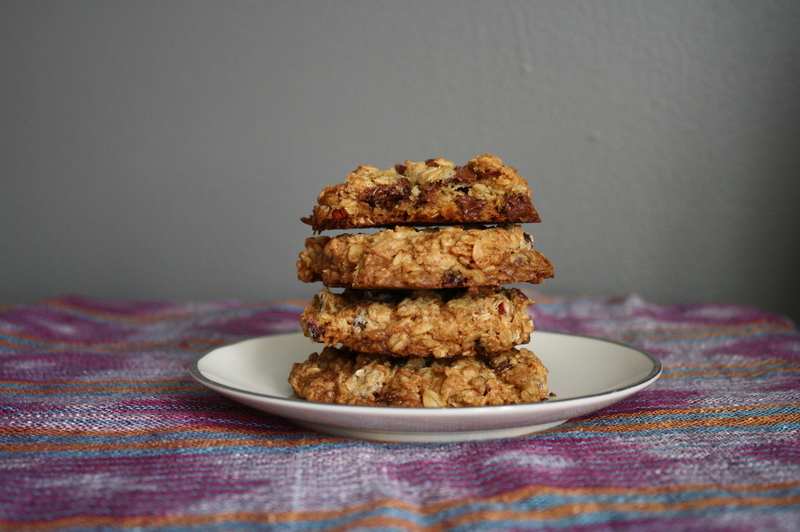 (Margaux): You definitely want to make these the size that the recipe says…I know it seems like really extra-big cookies, but they don’t turn out the same when smaller. 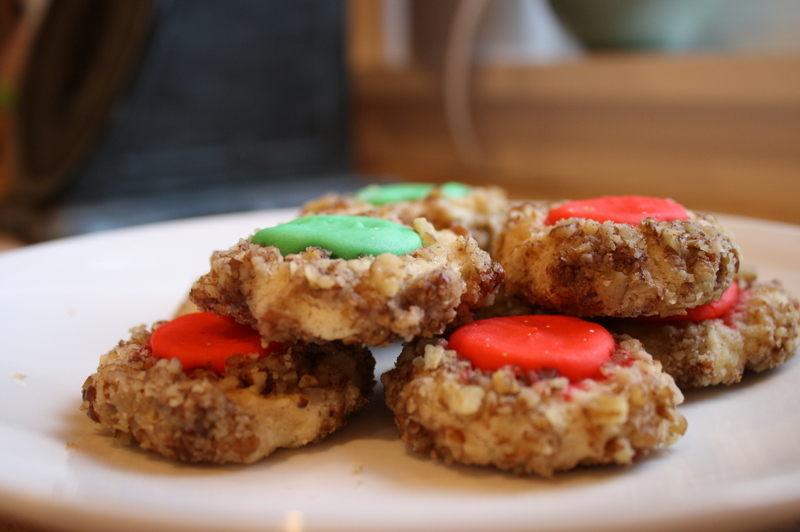 I tried making them smaller once (1 1/2 tbsp) in order to get more cookies out of it, and they turned out flatter and crispy. When baking, err on the side of under-done. They still taste great if they get a little over-done, but they’re really great when you take them out when the center looks puffy and slightly raw. 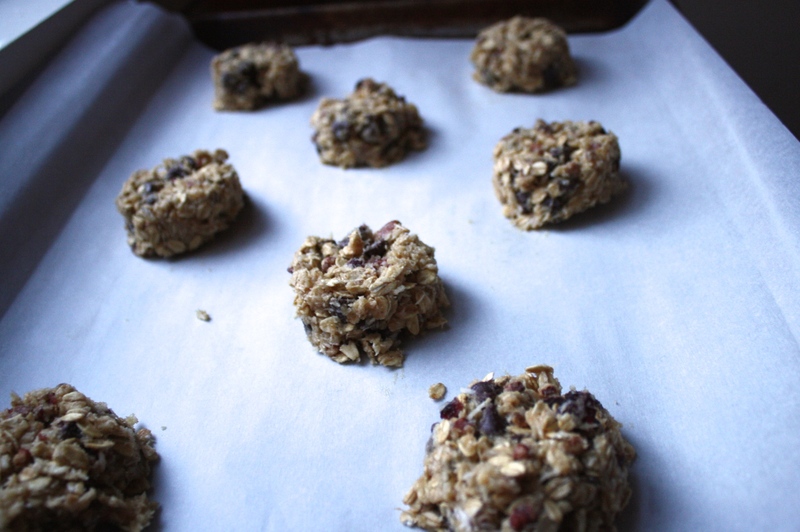 Because you let these cookies cool in the pan, they continue to cook after taking out of the oven. I found that for my oven and pan combination (I used a regular aluminum cookie sheet) that 12 minutes was just right. (Aunt Suzy): Because I like a cookie with not so much chocolate, I used 1 cup of chocolate chips and increased the nuts (pecans) to 1 cup. 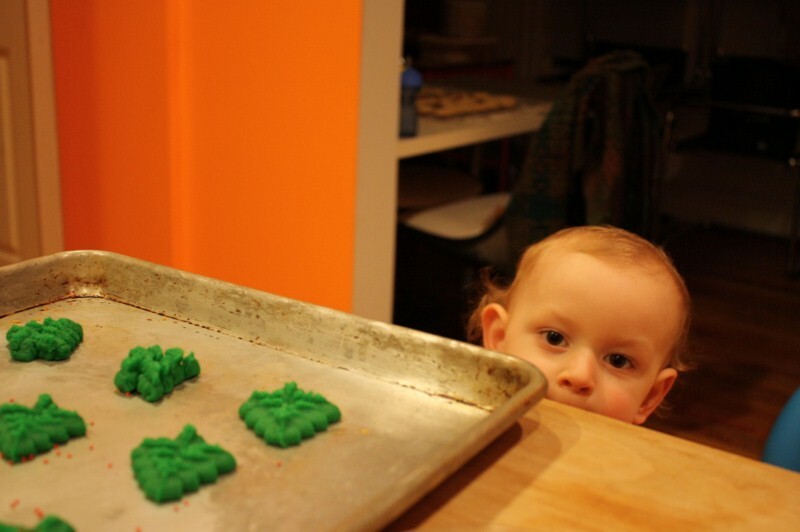 I agree with Margaux about the amount of cookie dough to use – don’t make them too small, although it’s tempting because these cookies are a lot of work for a small number of end product. I ended up with 19 cookies, a little more than promised. Taking a cue from Cook’s Illustrated, I did an experiment of my own. 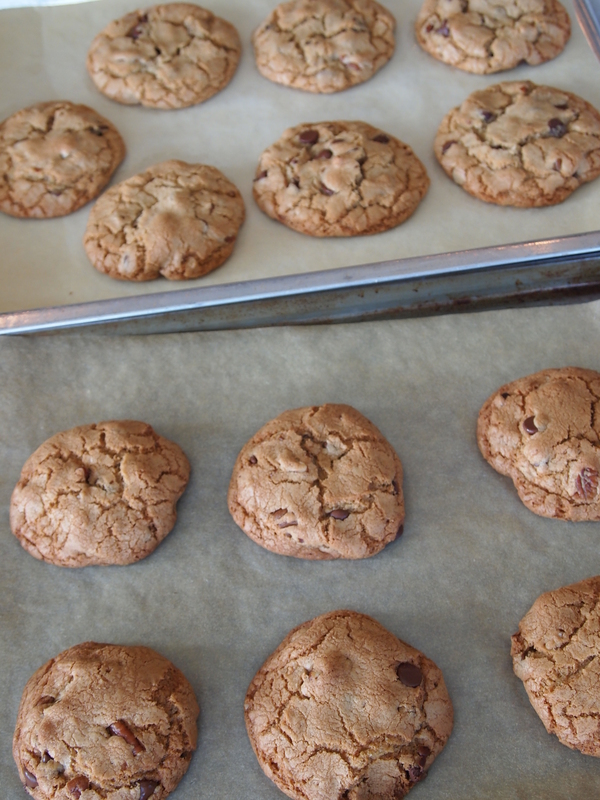 I baked a batch on an insulated cookie sheet – the kind with air in-between 2 layers of metal – and a batch on a regular aluminum cookie sheet. They came out very different! The ones on the insulated spread out more and those on the non-insulated sheets were rounder and a little more well-done. Perfect timing for my oven was 10 min for non-insulated and 12 min for the insulated. Both batches taste great, but if you’ve got an insulated cookie sheet, I’d recommend using it. 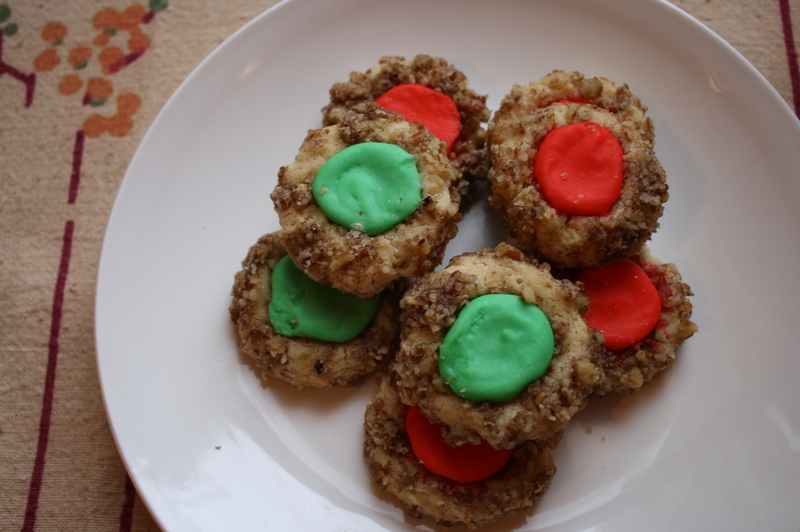 I love the pecan shortbread cookies that go by various names, and when I saw this variation with two of my favorite flavors, I knew I had to make them! I followed the recipe with a couple of minor adaptations. Instead of using instant espresso powder, I used Starbucks new Via instant coffee, Vienna Roast. It was perfect – each little packet is one teaspoon and it is plenty flavorful without dominating. At first I thought the cookies were a little dry, but the next day they were superb! I made these and the traditional ones, Grandma’s Butter Balls, on the same day and it’s hard to decide which I like better! Many taste tests have ensued, with inconclusive results, making me think that more taste tests are required :-). One thing we can say is that both are outstanding with a cup of coffee or tea. 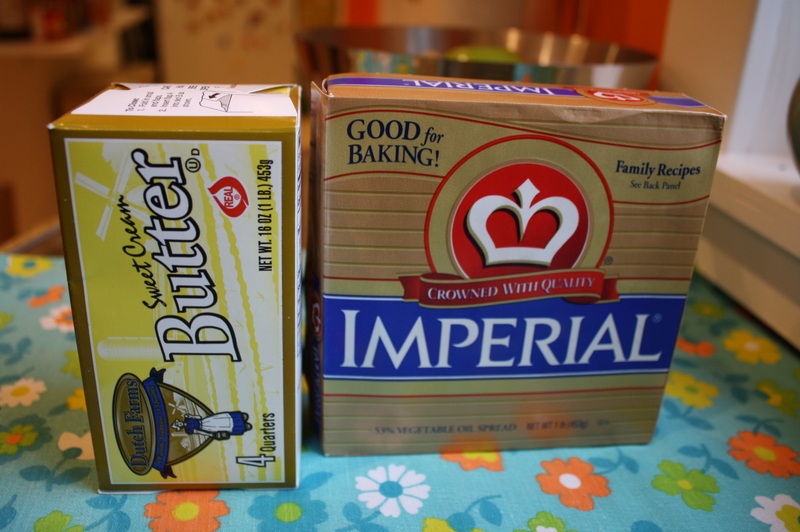 In a large bowl, mix the butter, sugar and vanilla until smooth. Stir in the flour, cocoa, espresso powder and salt until thoroughly blended. Mix in the pecans – I do this with my hands to make sure they are evenly incorporated. 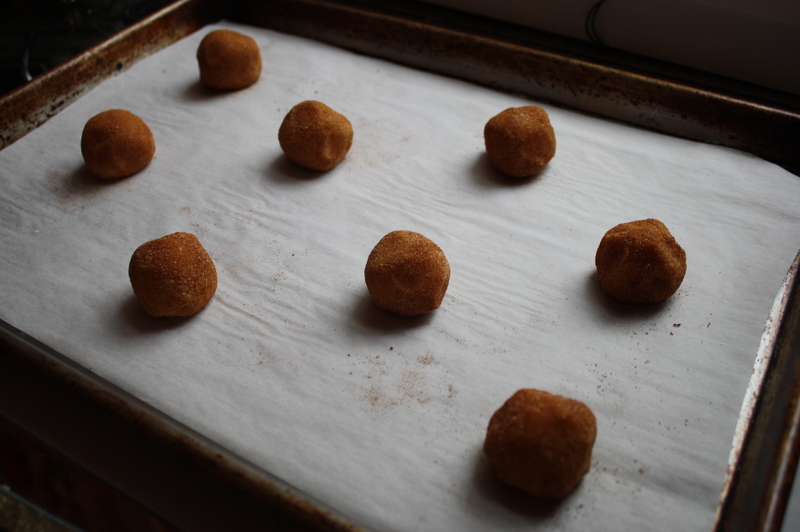 Working in batches, roll the dough into balls about the size of walnuts and place on 2 cookie sheets – about 2 inches apart. Bake one batch at a time on the center oven rack for 15-20 minutes, until the tops are dry and the cookies are slightly firm to the touch. 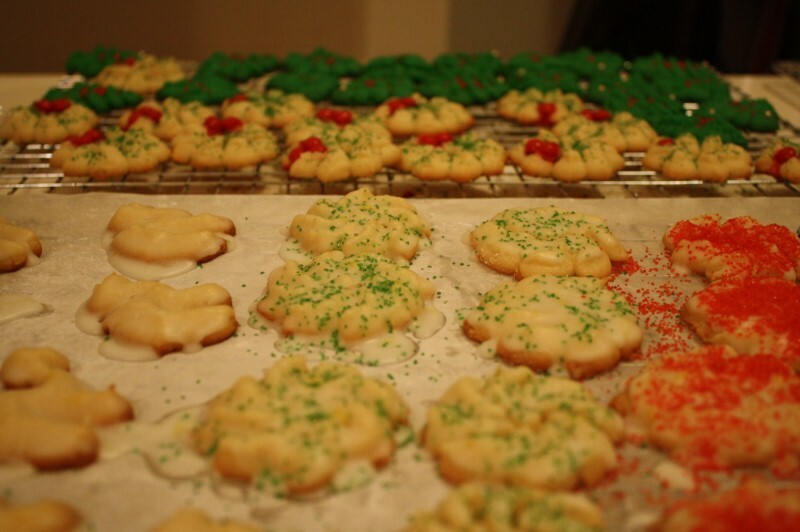 Let the cookies cool on the sheets for 10 minutes, then transfer to a rack. 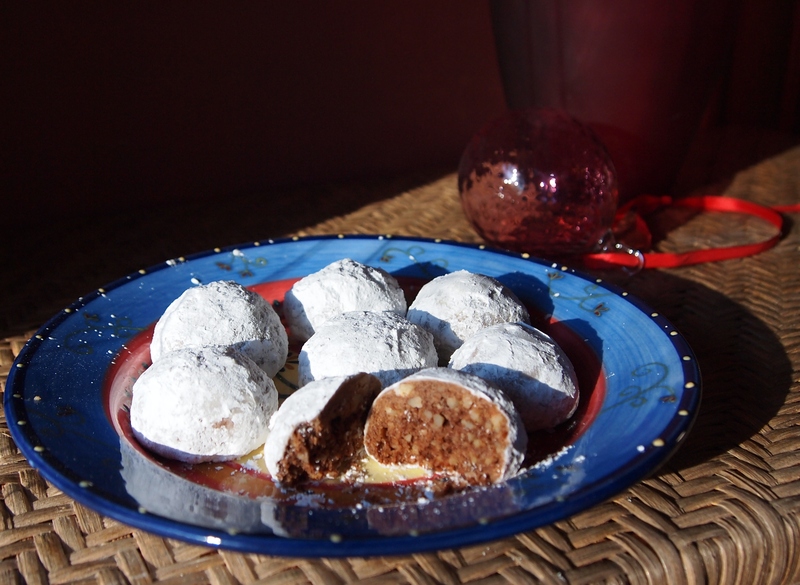 Roll in confectioners’ sugar to coat and place on a serving plate. I recommend rolling in confectioner’s sugar a second time about an hour later to completely coat them.